With Easter on the horizon, this is one of those fun family holidays we look forward to sharing activities with our children. Aside from the dyeing and hiding of Easter eggs, what else can we plan with the kids? Let's take a look at four fun, memory-making activities we'll enjoy with our children this spring without breaking the bank before summer. 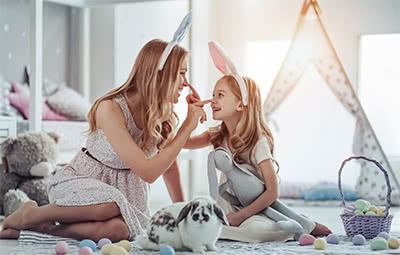 If you're a fan of Pinterest, you may have seen this relatively new trend for kids and their parents to enjoy on the day before and during Easter morning. Depending on the number of kids you'll be hosting for this activity, all you'll need is a handful of jelly beans and a bag of lollipops or suckers if that's what you prefer to call them. Give each of these children a couple of jelly beans, arm them with a large spoon or plastic garden shovel and take them out into the front or back yard to plant their "seeds." While they're sleeping or before they rise, go out to the "garden" and place the sticks of the lollipops into the soil where the jelly beans were buried. If you don't have outdoor space, perhaps they could be planted indoors in a houseplant or put them into a bowl of water. Similar to Christmas morning, even if kids don't "believe" in Santa, they can still get some "presence" from the Easter Bunny. Once we have all those boiled and decorated Easter eggs on hand, making Egg Salad sandwiches or Deviled Eggs is always an option. To play with kids further using these leftover poultry products, consider having an egg race. This is a challenge of balance rather than speed as contestants must compete to reach the finish line with a hard-boiled egg in a spoon. An event like this helps to level the playing field when there are children of various ages involved. If toddlers are involved together with teens in this race, consider holding different age-related heats or starting younger runners closer to the finish line. Candy set aside from Easter baskets before they're constructed could be awarded as prizes. Or for those who want all entrants to receive an award, make some hand-crafted ribbons in advance. Paper, pencils, pens and crayons go a long way given the limitless imagination of a child when they're given these tools. Instead of buying gifts or cards for friends and family members, suggest children create these themselves. Don't be a dud and join in on the fun while they're making these handmade keepsakes. As an added bonus, check out some of these creative envelope templates available online to be downloaded and then printed. With a few cuts from a pair of scissors, a little bit of folding, applying tape or a few swipes from a glue-stick, kids can create their own envelope to store these creations in before the presentation. Check out choice number seven of these designs that will fit a standard piece of 8-1/2" x 11" piece of paper folded into quarters inside. If you're cutting corners due to a pile of high-interest credit card bills, Spring is the time of year for cleaning so why not think about debt relief options available to help lighten this load. Contact us and one of our representatives who will see if there are avenues available to free you from this stress before next Easter.